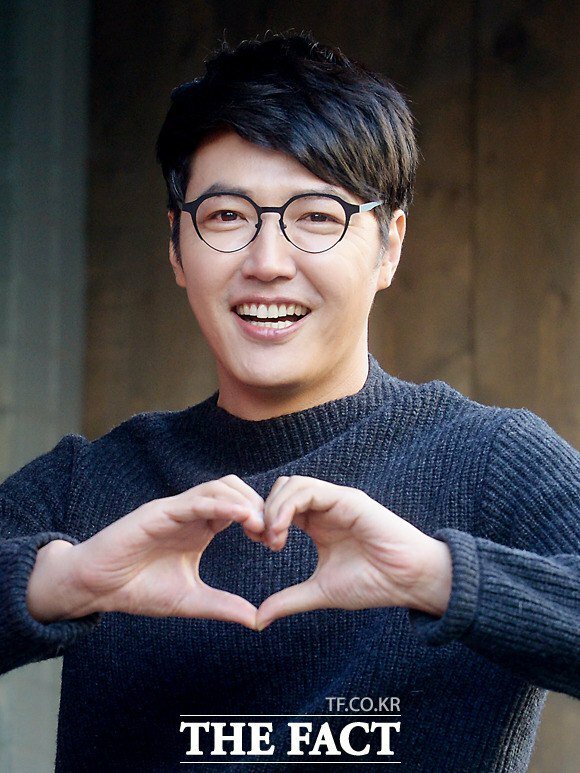 Yoon Sang-hyun is a man in love. His bright face, higher speaking tone and happy smile says it all. We met with actor Yoon Sang-hyun recently in a café in Seoul and he greeted us with a warm smile. He's looking forward to marrying singer and songwriter MayBee and he answered questions that weren't even out yet. All he talks about is his bride-to-be. But we met to talk about the movie "A Dynamite Family". He didn't seem to notice the complex expression on the promotional staff's faces. The first movie Yoon Sang-hyun chooses in two years is "A Dynamite Family", a comedy about five brothers who come to be because of their remarried parents. They set out to find their missing parents. Yoon plays Soo-gyo, the eldest of the five, the second eldest is Song Sae-byeok, Lee Ah-i, the fourth Hwang Chan-sung and the youngest Kim Ji-min. Lee Kwang-soo is the security of the village. The news about Yoon and MayBee's marriage was ahead of the movie and she showed up for the VIP premier of the movie Yoon Sang-hyun smiled at the mention of her. "I was worried. I thought it was funny when I chose it but I wondered what other people would think. But MayBee said she didn't know time had gone by so fast. She said it wasn't boring. It meant a lot". The character of Soo-gyo is a frustrating one. He is nice but he has zero flexibility and tries hard to be the eldest of the family but doesn't work out the way he wants. The movie itself isn't boring but the same can't be said about Soo-gyo. "I read the script and felt suffocated. We are very different However, I feel parents would like this movie a lot. Although my character was a pain, in the end I feel good about it". There's another reason Yoon Sang-hyun chose "A Dynamite Family". After becoming a Hallyu star for "Secret Garden" in 2011, he was tired out and was in the slumps for a while. He seems so cheerful but in a way he's a typical Korean man who thinks there's nothing but his job. He's alike with Soo-gyo in a way. "I used to think that all men had were their jobs. However, now that I am older and wiser I see things differently. I choose my work differently and now that I think about it I think my arrogance blinded me back then. I wanted to become a star. My agency was rejecting anything that didn't have me in the lead since "Secret Garden". I wanted to do them but now I don't see what it has to do with anything. I want to meet a really happy character". "A Dynamite Family" means several things to him. It allowed him to let go of his greed, find happiness, meet love and be brave about it. "Everything happened while making the movie. This movie is like a lucky charm for me. I met MayBee while making the movie. I was so lonely. I wanted to get married but couldn't propose. Then I went out on "Healing Camp" and made a public proposal. Now I am getting married. I hope everyone who watches the movie also gets lucky". "Getting to know "A Dynamite Family" Yoon Sang-hyun"
Lee Byung-hun's case: Will the host become the master key?